Long John Silvers Chicken Planks are a great menu item from Long John Silvers. I know you are familiar with their fish batter. Why not try their famous chicken planks? Growing up this was my family’s special Friday night dinner. We would go an get the best fish, I would get a paper hat. Walking into the whole restaurant was so much fun. There used to be a wooden dock you would walk across. There were ropes out there, you could run your fingers along them. When you entered the restaurant you walked down a narrow corridor to order your food. When you got ready to order your food, all of the cooked food was on display. You would see all of the fish displayed behind glass. I would walk down the ordering line, my face just in front of the cooked fish. It was the anticipation of enjoying the fish that was so central to the experience. One day they began to sell chicken planks. To tell you the truth, I was always a fish kind of girl here. Then one day I tried the chicken planks. It was amazing. Crispy batter coating tender chicken, back in those days chicken tenders weren’t found everywhere. So this place was amazing.
. I like it because it regulates the heat very well, and it has a filter so you can reuse the oil. I think peanut oil would also work well, but it is more expensive. Make sure the oil gets up to about 360 to 375 degrees. You will need to pat the chicken tenders with a paper towel, and dunk them into the batter and allow a lot of the batter to drip off. Then you will want to gently lay the chicken into the frying basket. You want the batter to cook for a moment or two as the chicken is laid into the basket. This way the batter won’t stick to the basket. The chicken is done when it begins to float, this takes about 5 to 6 minutes. You will need to flip the chicken over while it is cooking so both sides cook. I know you will really enjoy these chicken planks. Love these chicken planks? Make them at home. If you are not using a fryer, heat up 8 cups of vegetable oil in a heavy pot until the temperature reaches 350 degrees. Make the batter by combining flour, cornstarch, sugar, salt, baking powder, baking soda, onion salt, paprika, ground black pepper. Stir to combine all dry ingredients. Add club soda to dry ingredients. The batter will foam, continue to stir. Drop pieces of chicken into the batter. Coat chicken with batter, drop into hot oil. Fry chicken for 2 to 3 minutes on each side or until the batter is golden and the chicken pieces begin to float to the top of the oil. Drain chicken on a wire rack. i DIDN’T READ THE ENTIRE ARTICLE, BUT i DON’T SEEM TO SEE WHETHER THE “CHICKEN TENDERS” ARE RAW CHICKEN–OR ALREADY COOKED. Anyway, if someone could let me know, that’d be super! TIA! Raw chicken–6 min to fry done sounds kind of short to me. I guess as hot as the oil is and if the chicken piece is cut small enough, it would probably get done. Any answers for me? TY! 1. The chicken is raw to start with. 2. You need to buy chicken tenders they are a portion of the chicken breast, it is a specific cut of chicken that is naturally thin. Made a 1/2 recipe for tonight, substituted seltzer water for the club soda (was super fizzy), and will add in more salt for the next attempt. I started at 350 degrees with the oil, I think I’ll go a bit higher the next go around! I was concerned at first because I thought the batter may have been a bit runny?, but it wasn’t, I loosely mixed the ingredients, a bit lumpy, but not too much, dip and shake, drop in the oil and it fried beautifully! Stayed crispy until served and then they disappeared. Not entirely like the franchise, but close! Encore! Encore! Hint from a former LJS Manager. Freeze the chicken plank, dip the chicken into the batter while frozen and fry. I made this today, the recipe does not taste anything the L.J.S. what a waste of my money. I am very sorry you felt that way. What could have been different to make it taste like the real thing? Has anyone tried the freezing and then using the air fryer? I am new to the air fryer its still in the box but I would love to tJ this. 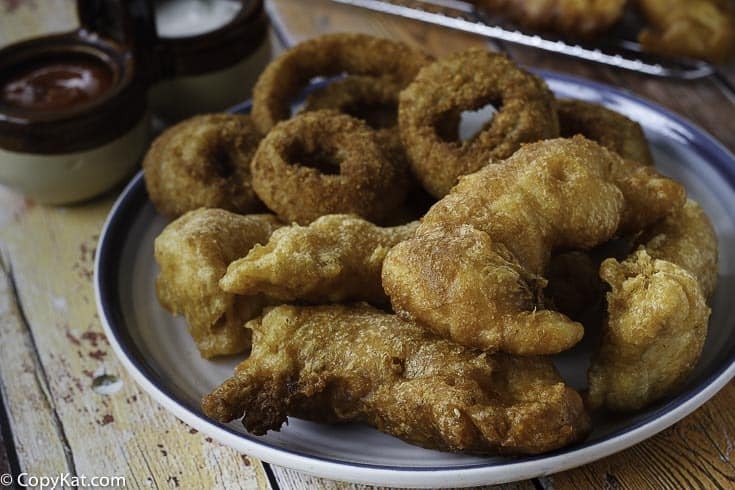 Do you use the same batter for the onion rings? 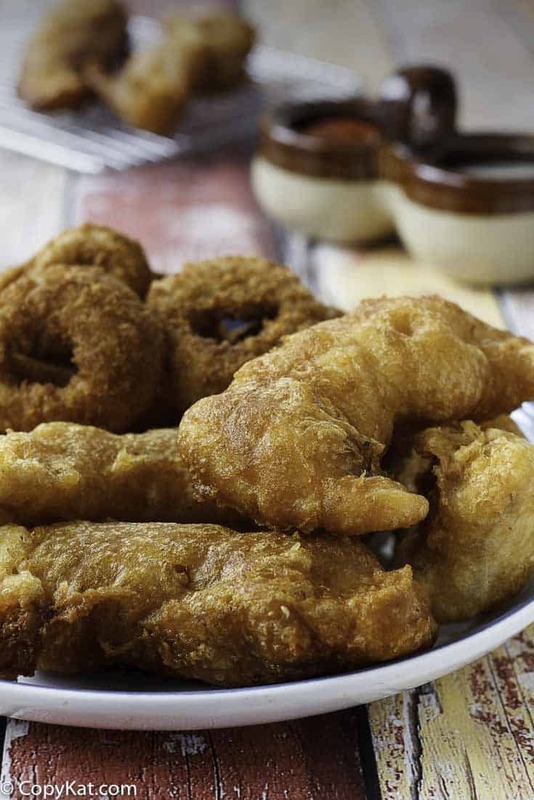 I have used this batter for onion rings & absolutely loved it!! We have also used this batter for veggies! It is an extremely versatile batter. How could this be adapted to an air fryer? I don’t think the batter would stay on. So I don’t think it would work. Great idea, I will have to give this a try. How do you keep all of the batter on while it freezes? This recipe sounds good! I have a thing for chicken.